Six rescued lions start their new lives in FOUR PAWS International's Big Cat Sanctuary, LIONSROCK, in South Africa. For Kongo, Nora, Neida, Simba, Pregan and Gypsy -- six lions, initially rescued from miserable lives in captivity --the long-awaited day has finally arrived. Just before the Fourth of July, FOUR PAWS International transferred the six lions from FOUR PAWS International's Big Cat Rescue Station, FELIDA, in the Netherlands, to FOUR PAWS International's Big Cat Sanctuary, LIONSROCK, in South Africa. While FELIDA has dramatically improved the lives of lions since FOUR PAWS took over the facility last October, LIONSROCK provides the lions with a more sizeable and permanent sanctuary. In order to facilitate this transport, FOUR PAWS logistics experts and animal keepers worked closely with an experienced team of veterinarians. 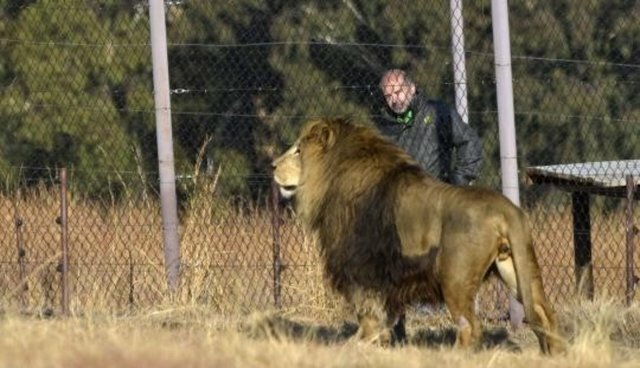 From FELIDA, the lions travelled via truck to Amsterdam and were then flown to Johannesburg via cargo plane. There, the local FOUR PAWS team received the animals and brought them to their new home at LIONSROCK. All six lions have similar histories – either forced to perform in a circus or live inside a zoo. The impressive, eleven-year-old Kongo and his same-aged sisters, Nora and Neida, were brought to the rescue station by their former trainer when he could no longer use them for his circus show. Simba and Pregan, both seven years old, were born in a zoo in Germany and transferred to the station in 2012. Pregan has no mane because he was castrated. Gypsy, together with her former companion, Romany (who died last year) were rescued from a desolate Romanian zoo. The eleven-year-old lioness suffers from a bone condition and cannot walk properly. Under the South African sun, these six lions will have a species-appropriate life; together with 80 other lions and 14 tigers in LIONSROCK. Heli Dungler, President and CEO of FOUR PAWS International, attended the release of the lions into LIONSROCK. "It was a very special moment for our team. In the Netherlands, the lions had limited space. Here in LIONSROCK, they can enjoy an area of nearly 2.5 acres". Due to her physical handicap, Gypsy received a special (and independent) care enclosure (27,000 square feet) near the LIONSROCK veterinary clinic. "The warm and dry climate will be very good for Gypsy's bones," said Dungler. All new arrivals have been carefully monitored by the LIONSROCK team along with a Dutch animal keeper, who accompanied her "protégés" to South Africa.